Dancing the Day Away | Glenwood, Inc.
On Saturday, May 19, individuals served by Glenwood and the Arc of Central Alabama enjoyed an afternoon of dancing and live music at Liberty Crossings United Methodist Church. 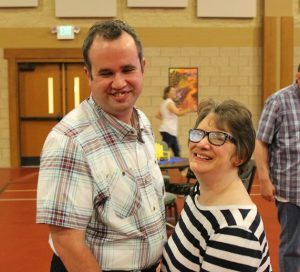 For the 11th year, Liberty Crossings hosted the dance for adults with autism and special needs served by these area organizations. Adults with autism share the common human goals of being respected members of the community, participating in activities of interest, maintaining valuable relationships while living as independently as possible. The partnership between Liberty Crossings, Glenwood and The Arc of Central Alabama furthers the mission of these organizations, by giving the individuals served an opportunity to grow their friendships while enjoying fun and laughter.